Add the steaks to a large glass baking dish and set aside. In a blender, combine the 4 chopped tomatoes, 2 Serrano peppers, 3 cloves of garlic, 1/2 cup cilantro stems, juice of 1 lime, 4 tablespoons white vinegar, 1/2 tablespoon oregano, 1/4 cup olive oil, 1/4 cup water, 1 1/2 teaspoons salt and 1/2 teaspoon pepper. Blend on high until smooth, and taste for salt. Add the marinade to the steaks and coat evenly. Cover and marinate for 3 1/2 hours. In a medium saucepan, add the 4 guajillo peppers, 8 chile de arbol peppers, 4 tomatillos, 2 whole tomatoes, 1/2 onion left whole and 5 cups of water. Bring to a boil, reduce heat and cook for 15 minutes. Drain the water and transfer mixture to the blender. Add 1 1/2 teaspoons salt, 1/2 teaspoon pepper and juice of 1 lime. Blend on high for 30 to 40 seconds until smooth, and taste for salt. Remove the steaks from the refrigerator 30 minutes before cooking. When ready, preheat a stovetop grill to medium/high heat for 10 minutes. Remove the steaks from marinade, shaking off the excess marinade, and transfer them to a plate. Brush the grill with canola oil. Grill the steaks for 2 1/2 to 3 minutes per side. Transfer to a plate, cover loosely with foil paper and let rest for 10 minutes. Warm the corn tortillas on the grill and wrap them in foil to keep them warm. Slice the steaks, against the grain, into thin strips. Transfer to serving dish with a lid to keep warm. 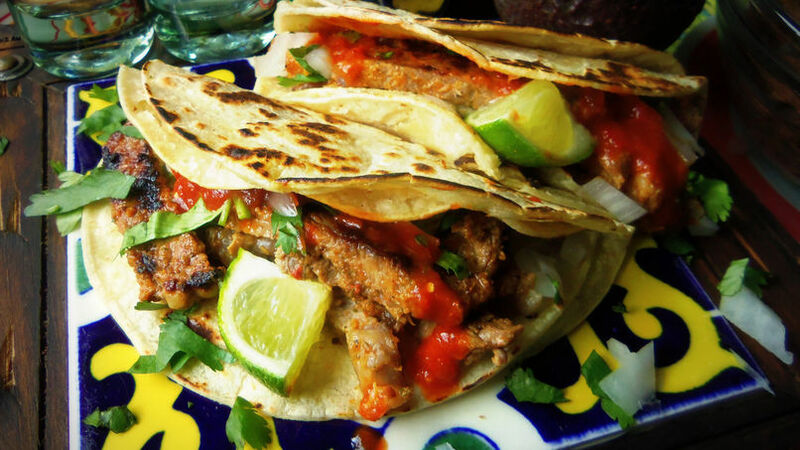 In Mexico, it’s common to serve 2 corn tortillas stacked on top of each other per taco. Garnish the tacos with the remaining diced onions, cilantro and salsa. For the best flavor, it’s always best to serve salsa at room temperature. Carne asada tacos are among the most popular of all Mexican tacos. Carne asada means “roasted meat,” in this case typically grilled sliced steak. And in my opinion, the best way to prepare them is with a simple garnish of chopped cilantro, onions, spicy salsa and lime.